An elevated sleeping cot, orthopedic mattress for aging arthritic pups, cozy burrowing bed, sleek sleeper sofas, waterproof puppy pad, humorous cartoon bedding, plush car bed with seat belt, and more of the best and most popular dog beds on Amazon that'll encourage your K9 to cat-nap. 1. 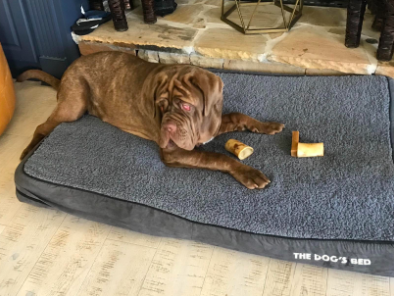 An ecoFLEX bed with a removable, washable cover and an elegant frame so the doggo in your home can sleep like a king. The largest size of this bed will keep dogs up to 100 pounds comfy, and the smallest can hold up to a 20-pound pooch. It's made of recycled materials, including a three-inch thick pad and a removable cover that you can wash to keep things fresh. It also boasts a five minute, no-tool assembly time so your pup can start snoozing right away! 2. An incredibly fluffy dog bed for your ball of fluff. This unassuming piece of fluff is the most luxe way to live. It's self-warming, meaning your pup is gonna be crazy cozy in this no matter the weather. The donut ball design is perfect for pets who love to curl up as they sleep. 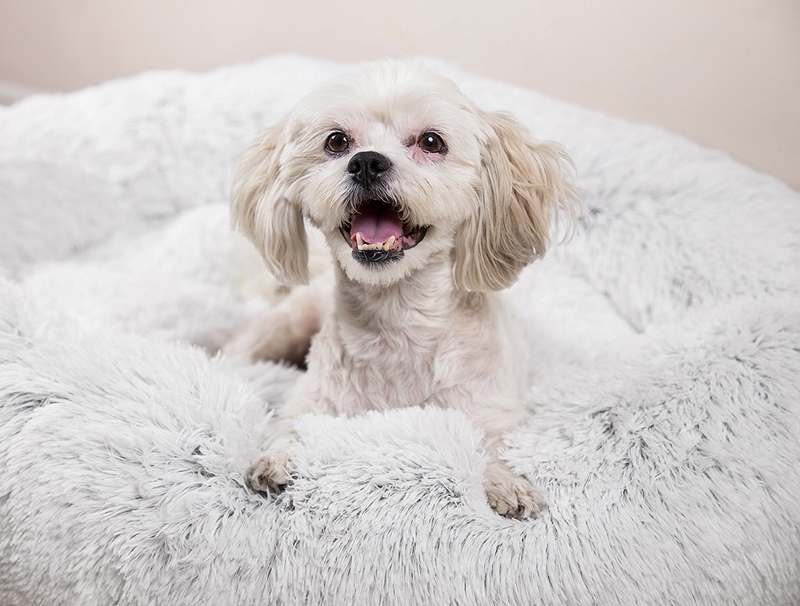 They'll move deep into the cushion (designed soft enough to give your older pets pain and joint relief) in the center as the edges of the bed wrap around them, giving their head and neck support and helping them feel secure. It also has a water resistant bottom AND it's machine washable. Bless. 3. An elevated cot — it's gonna help your furry pupper breathe easy and feel cool even on the hottest summer nights. The Coolaroo is designed to increase airflow and minimize pressure points while your pup sleeps. Sleeping on a suspended platform gives them low-impact naps to support healthy joints and the airflow from a suspended platform keeps even our furriest friends comfortable and cool. The bed is flea, mite, mold, and mildew resistant, lightweight, and portable (it's a great choice for an indoor/outdoor bed). And the recycled materials used make this a Greengaurd certified piece for your pet! 4. 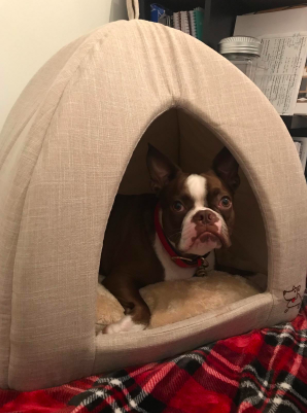 An adorable pet tent to help your happy camper sleep under the stars (or the ceiling) all night long. 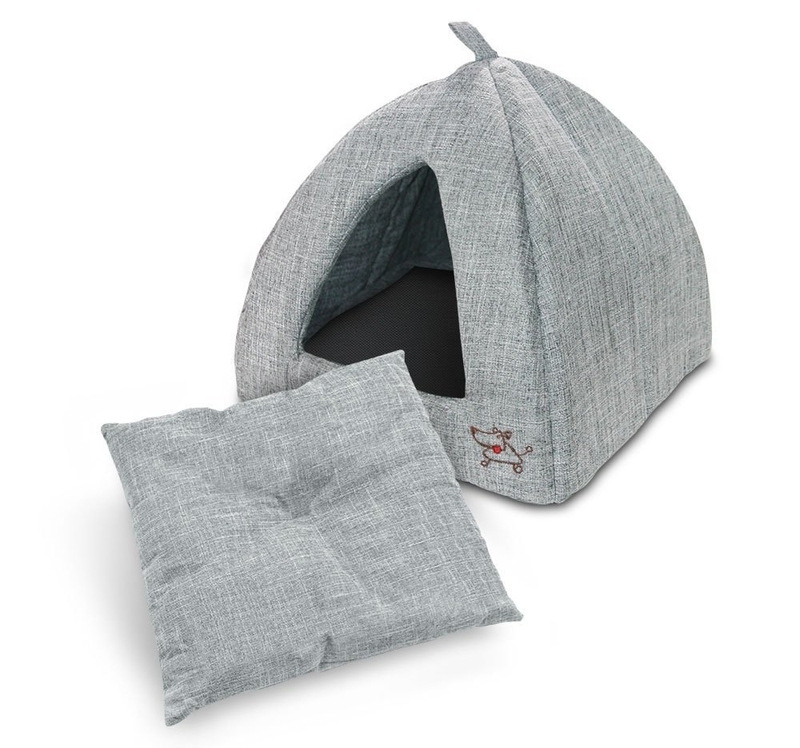 This incredibly cute canvas tent best fits pets under 65 pounds. It folds and assembles easily and has a soft mat as an added creature comfort. AND it's machine washable! 5. A velvet sofa that'll have Rover roll over and play dead... for eight hours straight. 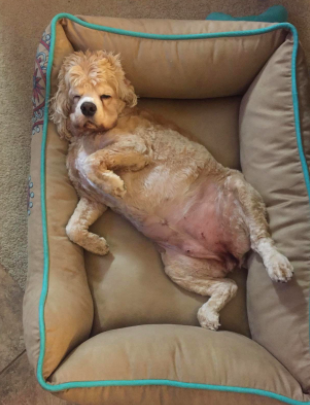 This sofa bed has an orthopedic base to best give your pup a comfortable and restorative sleep, no matter their age. It also has a water-resistant base and comes in so many sizes you could basically let a horse sleep on it like it ain't no thang. 6. A humorous shark bait bed which just might bite back. The best part about this shark bed (aside from it's crazy cute looks) is that it likes the water as much as the fish it was inspired by... it's machine washable! Woohoo! 7. 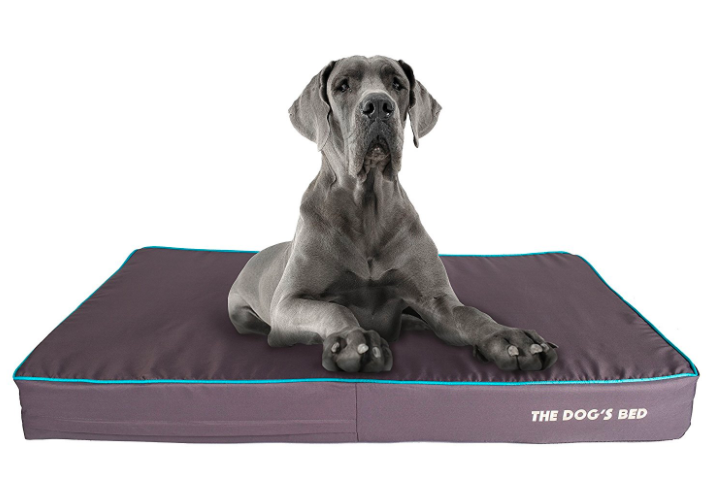 A memory foam bed made for massive dogs, so even your Great Dane can have a great night's sleep. This orthopedic memory foam mattress is designed to ease the pain of arthritis, hip dysplasia, and any post-op discomfort your dog may be going through. It's hypoallergenic and waterproof, to make cleaning easy for any incontinence accidents. The covers are safe to wash in the gentle cycle. The medical-grade support forms to your doggo's body and keeps them crazy comfortable through all ages and stages of their life. 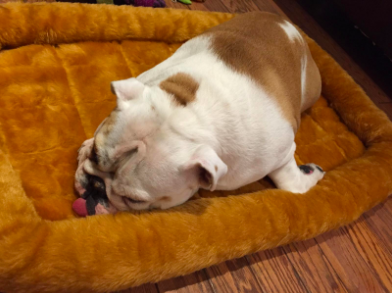 Promising review: "This is absolutely the BEST dog bed we've ever purchased! 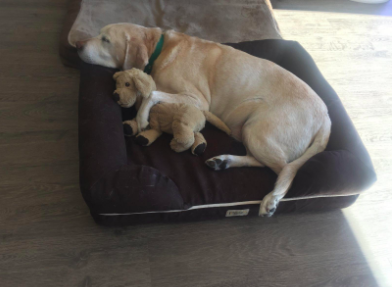 Our lab is a 75-pound senior with recurring hip and spinal issues, which at times makes it difficult for her to sleep well at night. This bed offers the support, roominess, and comfort needed to assure a good night's sleep (not only for her, but for us as well)! She was excited to lay down in the bed as soon as it arrived and has not suffered a sleepless night since! I HIGHLY recommend this product to anyone looking for a quality, 'exactly as advertised' dog bed." —Lydia J. 8. A deep dish bed that'll definitely be just their taste. Designed for doggos up to 35 pounds, this cozy cuddling bed is another self-warming masterpiece. 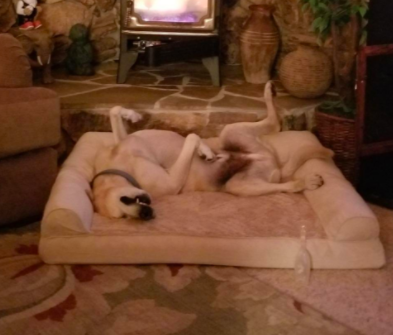 Although the edges curl up to give your pup a sense of security, they are designed to be movable so your critter can stretch out and snooze in any position. The base is waterproof (which also helps it stay put better on hard surfaces) and it's safe to put in both the washer and dryer. 9. 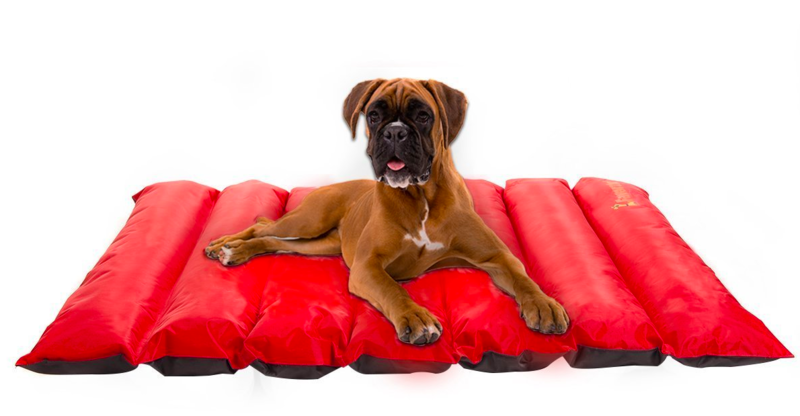 A portable dog bed for when Fido is ready to get up and go (and then promptly lie down for a nap when you get there). The fabric on this portable mat is designed to be taken literally anywhere. Does it work in a crate? Sure does. How about a car? Sit 'em on down! We're campers, so... forest floor? Go for it! It's waterproof, anti-wear, and easy to wipe clean. Roll it up, grab the straps, and run off wherever you and your pup are going without a second thought! 10. A squishy car bed to give your pooch the ride of their life (even if they sleeps through it). It can be super scary to drive in the car with your dog, but when they are sleeping (particularly if you use a seatbelt strap to keep them secure) it's easier to feel that they are safe. This is designed to let your dog curl up and feel safe and snug even while the car is moving. It's machine washable and has adjustable straps to keep it in place. 11. A bolster bed that's gonna make your pup snug as a pug in a rug. 12. A stunning love seat, because your S.O. doesn't want the dog on the sofa, but Snarls Barkley wants to be on the sofa, so you can compromise. This hilariously luxe set-up is designed for small pets (up to 20 pounds) with big personalities. The cover is removable and washable and the feet elevate the sofa to make it draft-free. 13. 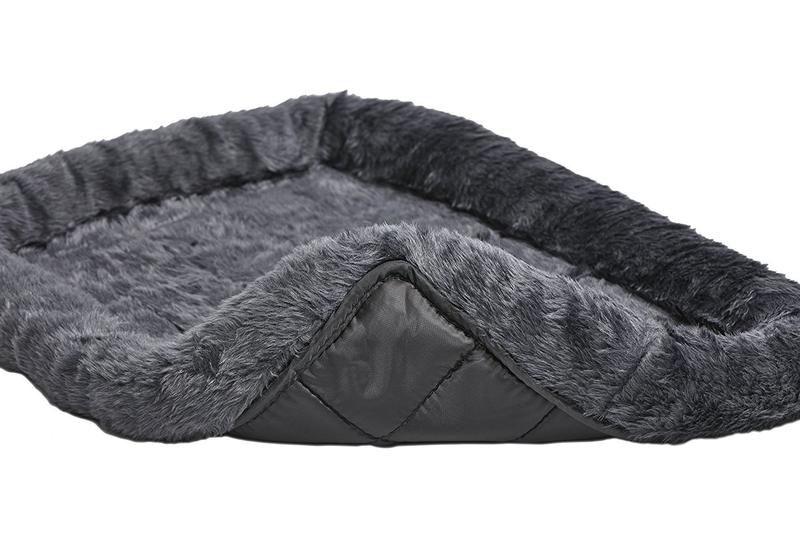 An faux fur bed for your fur baby. 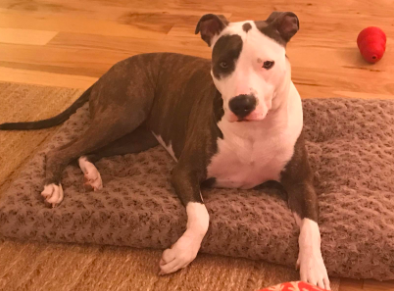 This mat has over 3,500 five-star reviews on Amazon, and apparently people (and pups) are loving it! It has a grippy bottom to keep it in place on hard wood and it's machine washable! Unlike your dog. 14. A dog cave, because your pup loves to burrow in your blankets and you wanna get him the ~sheet~ out of your bed. This burrow bed is washable and has a removable cover. 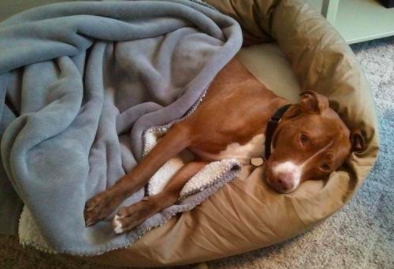 The top of the bed does not stay up on its own, providing a cozy environment specifically for dogs who prefer to burrow under blankets/sheets/pillows. It is best suited for dogs under 20 pounds. 15. An orthopedic dog bed so your senior dog can spend their days snoozing in the sun and you can sleep soundly knowing they're comfortable. 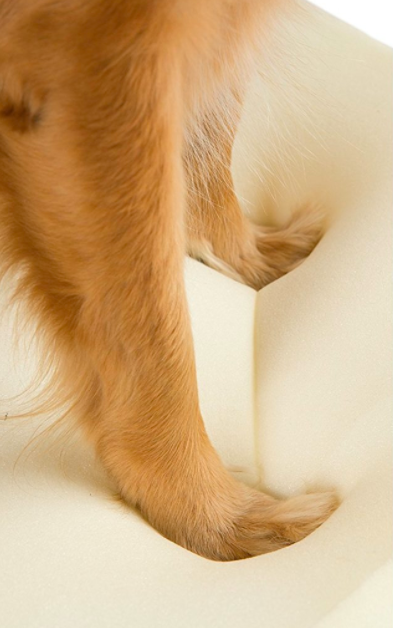 Using human-grade memory foam, this mattress is designed for durability throughout your dog's life. The water-resistant liner helps preserve the integrity of the bed for years and keeps your dog comfortable. The fur and hair resistant cover is anti-tear, removable, and machine washable. 16. A lovely leather sofa for your favorite couch potato. 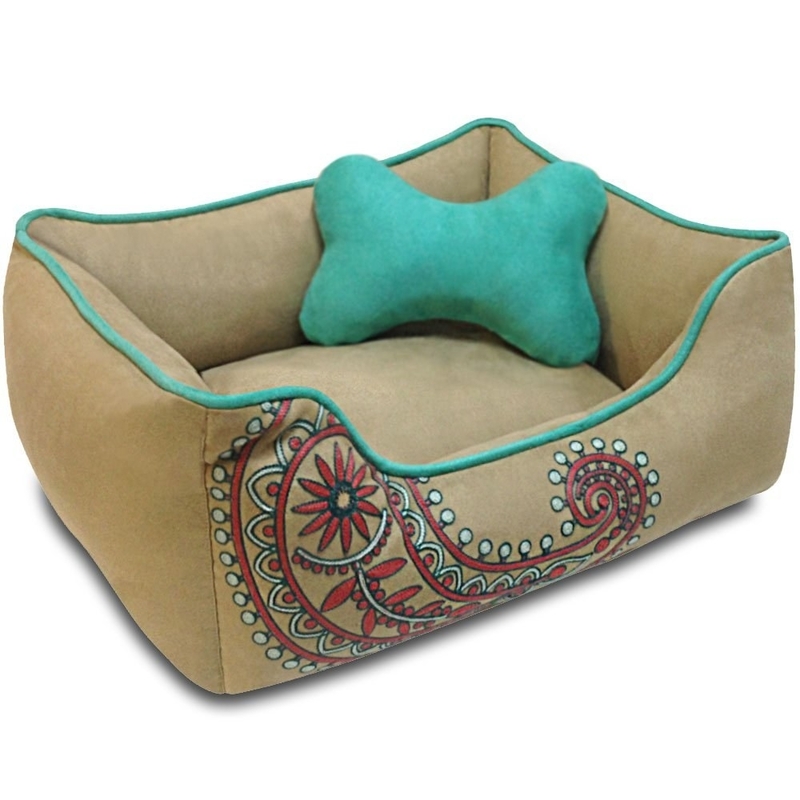 This dog couch is handmade with a wooden frame and durable leatherette fabric. 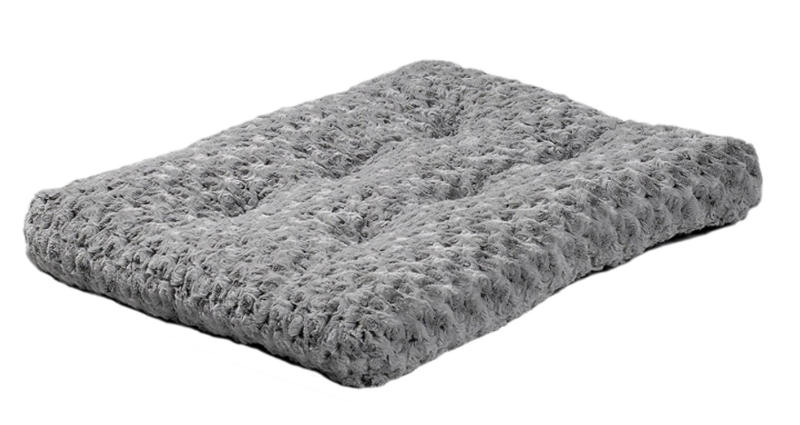 The cushion is made of reclaimed shredded memory foam with a soft and cozy fabric cover. This fits dogs up to 40 pounds. 17. A bagel bed your dog will love ~everything~ about. The base of this bed is waterproof and the full sides are filled with cushy polyester. These are made in the States and with over 900 reviews, it's a pretty big hit! 18. A pet-sized bunk bed that'll spoil your dog on a whole new level. This bed is designed with solid wood and stainless steel; it's painted with a glossy finish and has a scuff-safe bottom coating. It includes two washable microfiber pads. It requires very little set-up, but this thing is crazy sturdy. Like, it can handle a 30-pound pup on each level sturdy. Can you hear your pet asking you to get this for them? Because mine are. 19. A plush bed tent for your inside camper. 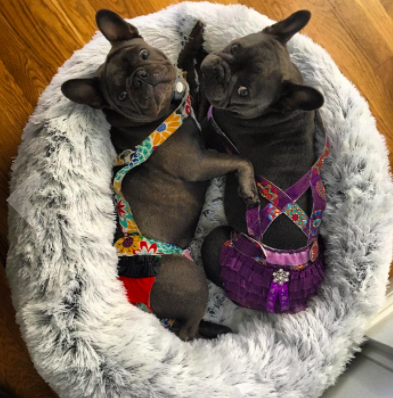 These beds are designed with a simple style and fashionable fabric to easily blend in with home decor (apartment pet owners, rejoice!) and they are machine washable. 20. A sofa bed, because your pup is part of the family and they're gonna want their own (mini) lounger to prove it. Comfortable for pets up to 12 pounds, this super cute sofa can be spot-cleaned and is raised with deep shoulders to keep your own Spot comfortable and cozy all day and night. 21. And a heavy duty sleeper that'll drift your doggo off to dreamland. 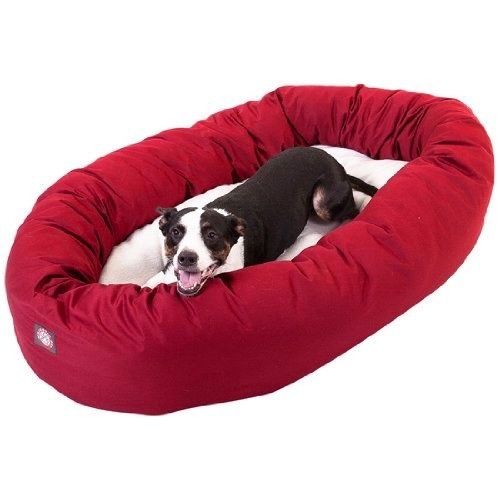 This solid dog bed is six pounds of pure 100% recyclable eco-friendly plush micro fiber. The microsuede fabric is comfortable, thick, and scratch-resistant. The cover is removable, and it's safe for both the washer and dryer! When your dog hears you say they're getting a new bed.